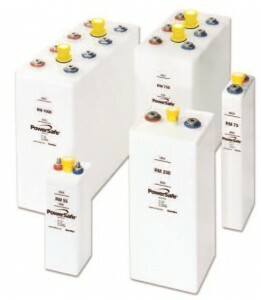 The EnerSys PowerSafe RM Ni-Cd Batteries are nickel-cadmium (Ni-Cd) batteries that are specifically designed for “mixed loads” that includes both high and low rates of discharge. The pocket plate design and Ni-Cd chemistry provide exceptionally long life at extreme temperatures. This coupled with the inherent low maintenance requirements make the PowerSafe RM battery series an ideal choice for UPS, utility and telecommunication applications. The robust design means an excellent resistance against electrical and mechanical stress, low risk of terminal degradation and a proven 20 year plus service life. This combination and extensive use in service make the EnerSys PowerSafe RM Ni-Cd batteries the right choice for industrial applications requiring superior reliability and the highest safety integrity covering discharges of 30 minutes to more than three hours. Cell Types available in the EnerSys PowerSafe RM Ni-Cd Battery series (number indicates AH Capacity).